After this bike tour you will not want to leave The Big Island. We will spend 12 days circumnavigating The Big Island of Hawaii by bicycle. Did you know Hawaii is home to 11 of the world's 13 climate zones? We'll experience Hawaii’s dry & sunny Kona & Kohala coast, the barren moonscape of Kilauea Caldera, the lush rain forests of Hilo and small villages along the way. Camping on black and white sand beaches, near palm trees, and next to plumeria bushes in bloom is a experience you won't soon forget. We'll spend two days (and nights) exploring Hawaii Volcanoes National Park, a World heritage Site and International Biosphere Reserve. While on this tour we'll ride past rushing waterfalls, coffee farms, botanical gardens, expansive free range cattle ranches and spectacular coastlines making sure to stop for local shaved ice and Malasadas. This is without doubt one of the most beautiful tours anywhere. This tour has a blend of camping (5) and indoor (6) overnights. We'll camp for a night or two and then have indoor lodging for a night or two, (with a laundry room available). Overview: The best way to explore the Big Island of Hawaii is from the saddle of your bicycle. The Big Island is home to 11 of the world's 13 climate zones. There are as many different climate zones on the island of Hawaii as exist along the entire coast stretching from Alaska to Costa Rica. Experience Hawaii’s dry & sunny coast of Kona, barren moonscape of Kilauea Caldera, lush rainforests of Hilo and friendly villages along the way. As we circumnavigate the entire island, we will camp on black and white sand beaches, near palm trees and next to plumeria bushes in bloom. We will cycle past rushing waterfalls, expansive free range cattle ranches and spectacular coastlines. It is without doubt one of the most beautiful tours anywhere. Our tour starts in historic Kailua Village (Kailua-Kona), not far from the airport and Bike Works expansive bike shop. Kailua-Kona, 0 miles. We will meet at 4:00pm at a hotel in Historic Kailua Village. We will have our introductions, orientation meeting, and I will pass out our maps and cue sheets. After we have completed our meeting we will walk to our first dinner together. Kailua-Kona to Ho’okena Beach, 26 miles. 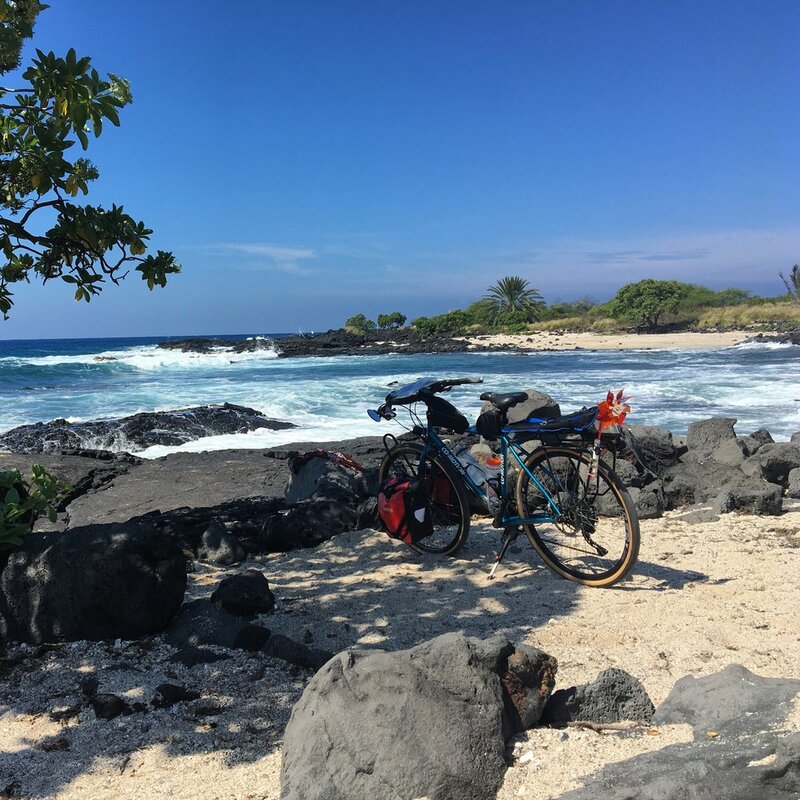 We will start our ride pedaling down the Kona Coast on a small road that bypasses the main roadway, passing beautiful beach parks along the way. After we have cycled up hill for a little over 1,000’ we will ride past active Kona coffee and fruit farms that offer tours and free samples. We will descend to our overnight destination at a protected private beach park. This beach is a favorite for snorkeling and kayaking. We will enjoy our dinner while sitting at a picnic table on the sand watching the water. Tonight we fall asleep listening to the sound of waves. Ho’okena Beach to Punalu`u Beach, 48 miles. After leaving camp, we ride back on the back up the road. Most of the day we spend riding a long, gradual ascent along the South Kona coastline. Turning eastward we approach the Ka’u region, near the base of the Mauna Loa volcano. We finish today’s riding with a fun descent that passes through Naalehu, the southernmost town in the U.S. Tonight’s camp is at black-sand beach park with more snorkeling and where we’re likely to see sea turtles sleeping in the sand. Punalu`u Beach to Hawaii Volcanoes National Park, 26 miles. Leaving camp early to take advantage of cool morning temperatures we will climb to over 4,000 feet above sea level. Tonights destination is Hawaii Volcanoes National Park. We will be staying indoors in Volcanoes National Park the next two nights. While here we will be able to rest, do laundry, explore on foot and by bike. The park’s visitor center is well worth a visit. After dark we can walk along the Crater Rim Trail listening too and watching the volcano light up the night sky. Hawaii Volcanoes National Park loop, 41 miles “optional”. If you choose to you can start the day by pedaling a section of Crater Rim Drive amid a steamy lava landscape with breathtaking views into the active Kilauea Caldera and Halemaumau Crater. Together these two form the heart of Kïlauea volcano. While hiking you can explore the Thurston Lava Tube, a 400-year-old natural structure, or hike down onto the actual Crater. We spend a second night here watching the nighttime volcano lightshow. Hawaii Volcanoes National Park to Arnott's Lodge in Hilo, 33 miles. Today we will have our choices of riding on pavement all day or splitting it up with half the ride being on a pavement with some dirt road along the scenic rural coastline. Once back on the main road we head to the city of Hilo. Along the way we can ride through a 2,500-acre macadamia-nut orchard. A little further we will get off the main road just as traffic gets heavy, wandering back roads to our indoor overnight. Home for the next two nights is a wonderful hostel. This hostel is located very close to many wonderful snorkeling beaches, Historic Old Hilo and The Japanese Gardens. We will be able to do our laundry, sleep in a bed and enjoy a full kitchen. Free coffee is available 24 hours a day. Hilo, 0 miles. Layover day. This morning you can sleep in, ride up to Rainbow Falls, walk or bike around the city, go to a local bike shop for supplies or repairs, have lunch in town and spend time on a nearby beach. Hilo to Laupãhoehoe Beach, 31 miles. Leaving Hilo, we’ll cycle along the rugged Hamakua coastline, passing through a rainforest jungle with numerous waterfalls. You can stop at a botanical garden for a tour, even send some flowers to the mainland if desired. Tonights beach park campground has green grass and is located on rocky shoreline point with stunning views. Laupãhoehoe Beach to Wiapio' Overlook Hostel, 26 miles. Leaving Laupahoehoe, we’ll cycle along the coastline, passing through forested areas. You can stop Donna's Cookies for free samples of fresh made cookie and at Tex Drive-In for the best Malasadas on the island. Arriving early at the hostel, we will leave our bikes behind and hike down the trail into the Wiapio' Valley. Wiapio' Overlook Hostel to Waimea, 12 miles. Today we’ll climb from sea level to almost 3,000’ in 12 miles. Along the road we can pick up ripe fresh dropped avacados as we cycle through the historical Parker Ranch. Tonight we stay in a beautiful newly remodeled Inn. While in Waimea you can explore Hawaii’s nearby Anna Ranch Heritage Center, visit The Waimea Brewing Company and stop in Mountain Road Cycles bike shop behind the brewery. We can watch the sunset from our high vantage point with a short walk or ride and in the morning we can watch the sunrise over Mauna Kea from our balconies. Waimea to Spencer Beach, 40 miles. This is one of my most favorite rides that I have ever done! Leaving our Inn we pedal up into the Kohala Mountains, riding close to the ridgeline with amazing 220 degree views. Then we get to fly down to Hawi on our bicycles passing horse and cattle ranches. We can take a break at the local coffee shop before turning south. We will follow the very wide shouldered road the rest of the day. This section is a part of the famous Ironman route. As we pedal along the North Kohala coast, we will pass several public beaches (snorkeling). Before arriving at our campground we will stop in Kawaihae for lunch at the locals favorite spot. Protected from high surf by an offshore reef, the tonight’s beach park has great swimming. Spencer Beach to Kailua-Kona, 35 miles. Our last day of cycling takes us along the South Kohala coast. I have a favorite snorkeling spot that I will gladly share on our ride back to Kona. We’ll return to Kailua-Kona in the mid-late afternoon. Catching a “Red Eye” flight is an option or spend another night with your new friends in Kona reliving shared memories of the last 12 days. Checks and PayPal accepted. Email ruth@damseltours.com for more details. Contact Ruth for more information at ruth@damseltours.com Signups have begun, so don't wait to secure your spot.